I came across a post from a while back - April, 2008. In it the author describes the year at which residential rooftop solar reaches grid parity. The post is brilliant in its simplicity. 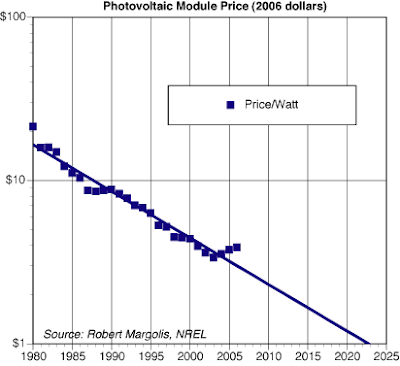 By taking NREL data, the average price of a solar module can be seen to be dropping at 6%/year. Extrapolating forward, while making the assumption that the installed cost will continue to be twice the module cost (which may not be true as improvements to module cost have seemed to be happening faster than installation improvements - but we can hope), as well as making a couple of other reasonable assumptions on interest rates and cost of electricity, he demonstrates through a pretty simple NPV analysis that by 2015, solar will have reached grid parity in Minnesota. That's pretty striking, and he didn't provide what the solar resource was like in Minnesota (although, it might be pretty good - there is a latitude issue, but I bet that there aren't many clouds). I like this analysis because it is so simple, and it's fairly easy to change any assumptions that you might disagree with and see what there effect is. 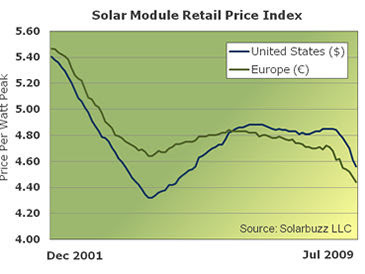 This graph from Solarbuzz shows that module prices have started to work through the silicon shortage (it had to happen sometime!) and prices have resumed their downward trek. This might push out the grid parity time an additional five years - or, due to the billions of investment dollars that have gone into solar in the last few years (and given First Solar's announcement of <$1/W manufacturing cost) the price reduction curve could accelerate from 6%/yr to 10%/yr or beyond. At any rate, this is exciting as I believe that since electricity is a commodity, there will be a sharp tipping point once the economics work out, and this is all foreseeable in the next few years. 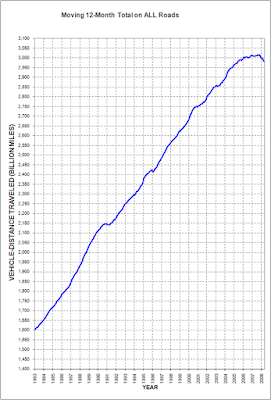 If you want to get an appreciation for just what a juggernaut the US driving public is, check out the following graph. I got it from Green Car Congress. This graph goes back to 1983 and shows a steady, almost inexorable, rise from 1.6 trillion vehicle miles driven annually to peak at just over 3 trillion vehicle miles. There are slight periods where the graph goes horizontal for a few months (which seem to map to various recessions). However, the biggest actual drop EVER has happened at the start of 2008, when oil prices were pushing gasoline prices through the roof. This should allow economists to get some idea of the elasticity of gasoline. I'd assume it isn't much. What I find striking is how much it is rising. I'd like to compare this to population. I'd also like to have a current version of this graph - one that includes the financial and job-market meltdown of late 2008. Gas prices have fallen, but when people aren't working, they aren't commuting. The reason I find this so arresting is that it took $4+/gallon prices to push drivership down to 2006 levels! I moved to Los Angeles in 2002 - what is the likelihood that this graph will drop to those levels? 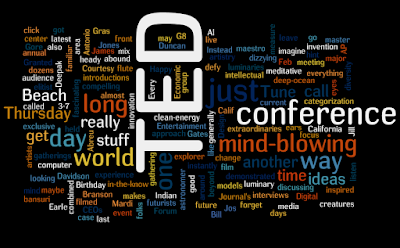 The above image was created with Wordle. You can give it any jumble, or text, or point it to a blog and let it mine its own words. It seems to have sampled heavily from my previous two posts, but I like the fact that it's so accessible. Wow. One well placed post and my readership increases 6x. There has been a lot of interest in my Type I/Type II characterization, and some interesting comments. Some of the things that I've seen from the discussions I've recently had relate to competition. 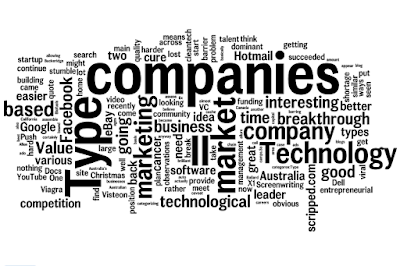 Type II companies may have a lot more competition than a Type I company would, and this is seen in the case of scripped.com, and various social networking sites. However, the key to making a Type II company work is to find other means, other than technological, to lock in a barrier to entry. Since there is bound to be lots of competition, other means can still establish a single market leader. For example, there was a time that Hotmail ruled the roost. While there was no barrier to switching, Hotmail's viral marketing established them as the dominant web-based email solution by far. Had Hotmail continued to provide good quality service (rather than getting suffocated by ads and spam, as what happened), they could have held that position for some time. Nevertheless, the position of a Type II company can be precarious. Hotmail lost to Yahoo and GMail, Friendster lost to Facebook, etc. It does appear, though, that a Type II company that has succeeded in being the market leader, only relinquishes the title when they stumble. 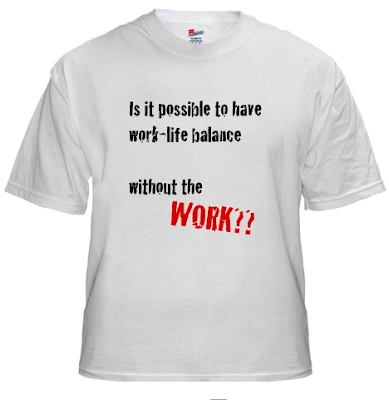 Otherwise, the market is happy, and actually prefers, to reward a dominant leader. I can't say that eBay has yet to stumble, and barring Craigslist (which, I believe has some relation to eBay anyway), there isn't another trading/auction site that has similar reach. At any rate, thank you all who contacted me. Interesting discussions.